An organic, protective, ultra-gentle Sun Lotion, especially suited to children with sensitive skin - SPF30. Children’s skin can be particularly sensitive to the harmful effects of the sun’s rays, and although we all know to keep out of the midday sun, it can be difficult at times to keep our children under cover! This is why it is essential to cover up with lightweight clothing and a high factor sun cream. 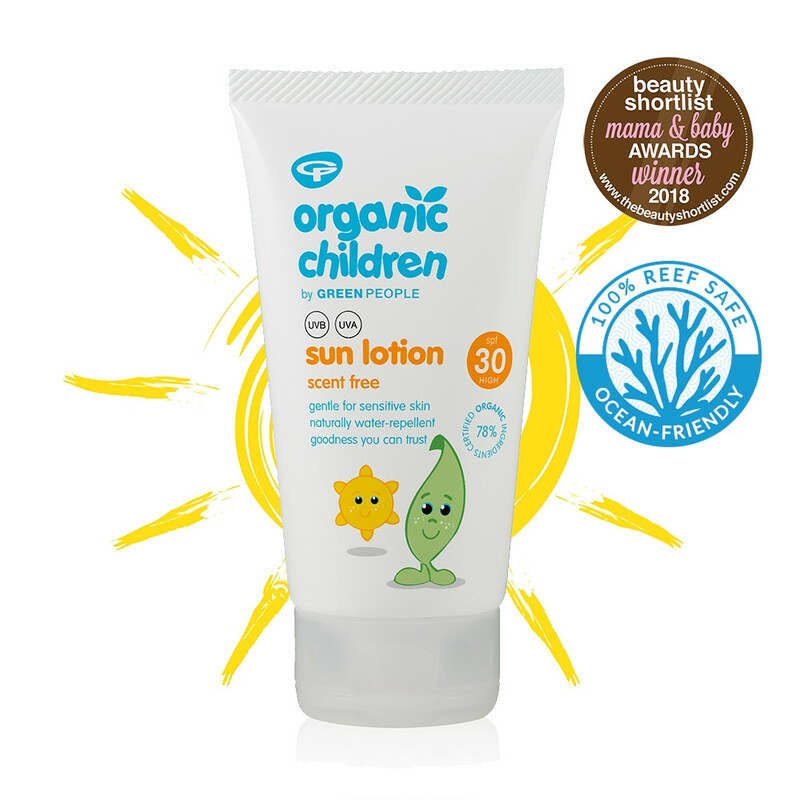 Organic Children Sun Lotion SPF30 by Green People offers 97% protection from UVB rays which cause skin to burn, along with broad-spectrum protection against UVA. This water-repellant lotion is packed with super moisturising ingredients and is non-greasy, so won’t clog pores. It’s perfect for all the family, but especially for children who suffer from prickly heat and have sensitive skin. Applying liberally and frequently ensures maximum protection. Main ingredients include Rosemary, to help relieve inflamed skin, antioxidant-packed Olive and Avocado, and soothing Aloe Vera. Skin Type: Suitable for all skin types, including sensitive skin and those prone to eczema and psoriasis. Application: Apply liberally to the whole body, ensuring full and even coverage, 20 minutes before sun exposure. Reapply every 2 hours, or after swimming. Tip: Suitable for children with sensitive skin and who suffer from prickly heat. Matching Products: To soothe the skin after sun exposure try Organic Children Aloe Vera Lotion & After Sun, which contains natural essential oils and has a wonderful cooling effect. Ingredients that Green People don't use in their products: Organic Children Scent Free Sun Lotion SPF30 is made without parabens, alcohol (ethyl alcohol, ethanol), lanolin, methylisothiazolinone, methylchloroisothiazolinone, phthalates, artificial perfumes, petrochemicals and colourants to bring you the purest children's sun lotion that nature can offer.